CAMERON POLLS | The Pahang government has confirmed that a four-wheel drive vehicle allegedly used for Pakatan Harapan's campaign in Cameron Highlands belongs to the state Forestry Department. Pahang state secretary Sallehuddin Ishak said the department was authorised to loan the vehicle to a ministry for "official use" by a deputy minister. "However, after the vehicle was found to be 'plastered' with logo of a political party, I have instructed for the vehicle to be immediately returned," he said in a Facebook post. In his post earlier today, Sallehuddin said his clarification was made in response to queries from netizens on the matter. Taking to Facebook, former prime minister Najib Abdul Razak also mocked Harapan over the alleged use of a government vehicle on the campaign trail. 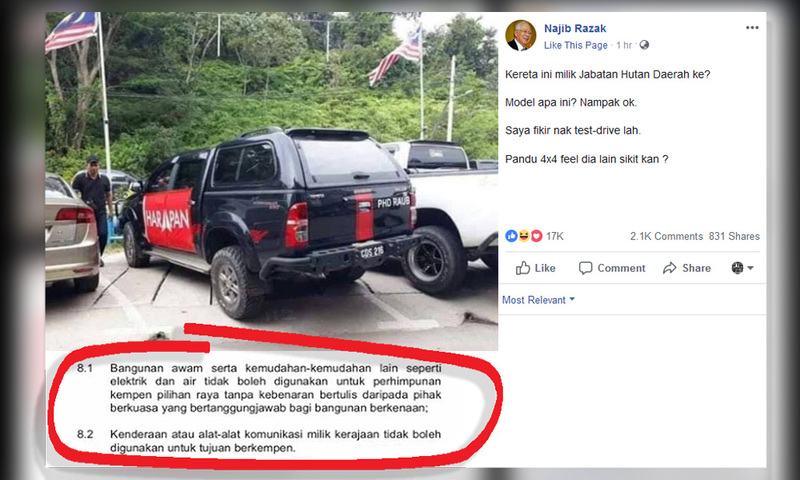 Najib had uploaded a photograph of a black four-wheel drive vehicle with "PHD Raub" written across the back and with the Harapan flag on its sides. The Pekan MP also included a screenshot of the Election Commission's Election Code of Ethics, pointing out that government vehicles cannot be used for campaign purposes. "Does this vehicle belong to the Forestry Department? "What model is this? It looks OK, I might test drive one myself. Driving a 4x4 feels a bit different, right?" read his posting, which garnered over 24,000 likes in four hours.